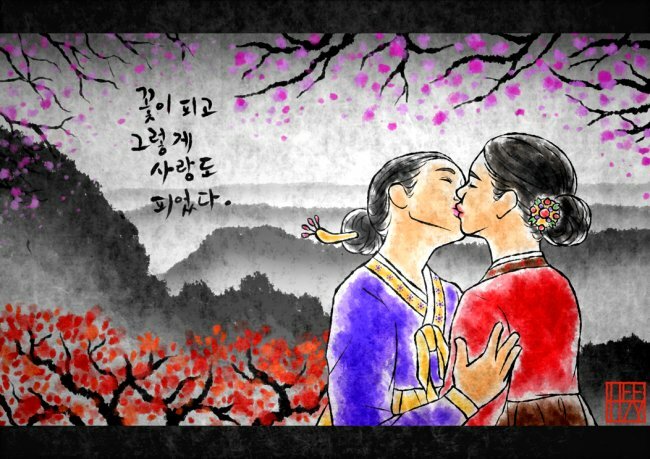 An art exhibition in will open Itaewon on Friday exploring LGBT life and other social issues in modern Korea. The show, by Heezy Yang, will include watercolors that echo traditional Korean style but depict homosexual couples, satirizing the claims of conservatives here, who have opposed gay events and gay rights in Korea, calling homosexuality a Western idea. Other images use a more modern graphic style to talk about not just homosexual issues but those of the education system and online censorship. Yang says he doesn’t belong to an organization but he has fund-raised for a support center for LGBT youths here, and also held an “Unjustifiable” performance art piece in public spaces to raise awareness of the issue. “Some people are kicked out of their homes because they are gay and their parents cannot accept that,” he said. The exhibition is held at Moloko Plus on the street opposite Sin Bin in Itaewon, colloquially known as Homo Hill. Opening hours are Thursday-Sunday from 9 p.m. For more information, visit www.heezyyang.com/.